PamperPup is your pet's second home, where furry-guests stay with us as part of the family. Here in our home with a 12,000 sqft pet area (indoor and outdoor), furkids live with their own bed, food, toys and enjoy all the comforts of home while away. There are no kennels and no cages involved. Their stay with us is always personal; with all the personal loving care, attention and exercise your furkid needs. We provide Pet and Dog Boarding services in Malaysia; servicing customers in Petaling Jaya, Kuala Lumpur, Puterajaya Puchong, Subang Jaya, Shah Alam and other areas within the Klang Valley. Just as you are right for your furkid, we as your pet's carer must be right for him/her too. Our aim is to provide you with complete peace of mind leaving your dog with us. We will be someone you can trust, can rely upon and know that your dog will be happy with when you go away. 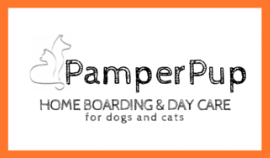 Booking with PamperPup home boarding and day care means you have the assurance of a homely environment; where caring, reliable and trusted pet lovers provide the very best in customer satisfaction before, during and after your dog’s stay. Not forgetting the 10,000 sqft garden aka OFF-LEASH PARK - your dogs will run around to their heart's content! We welcome you and your fur-babies for a visit to our cozy home prior to a successful booking. Kindly note that this service is only available for our in-house guests, and is subject to availability. For other grooming services, kindly contact 011 3311 8945 for further enquiries.